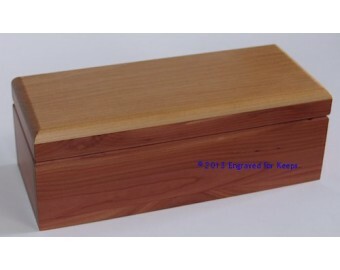 This beautiful Made-in-the-USA Red Cedar wood Keepsake Box comes with an Alder wood top. Because of the unique nature of Cedar wood, no two boxes are alike and vary in the amounts of knots & white cedar. A 3.25" x 8.5" space is available across the whole lid of the box for engraving a name, or a name & dates, or text of your choice. Dimensions 4" x 9.25" x 3.5" Outside Edges with Inside Edges approximately 3.25" x 8.5" x 2"
Engraving Options Includes personalized engraving with any amount of text that can fit in the 1.5" x 5" allotted space and your choice of standard font. 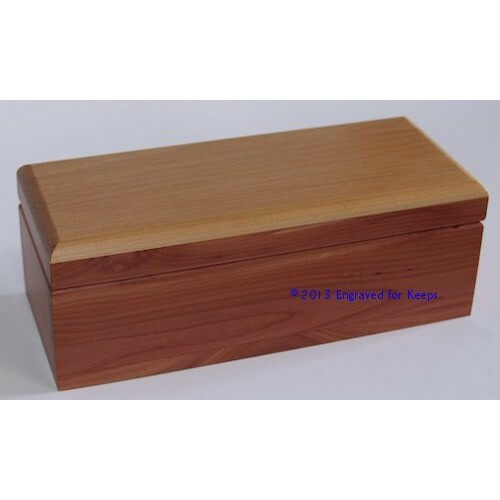 Features Available only in Cedar wood with Alder wood on top. Unlined interior with natural Cedar wood scent.